დაცვის სტატუსი / Protection Status: ტერიტორიის 59.55%-ს კოლხეთის დაცული ტერიტორიები ფარავს. / 59.55 % of territory is covered by Kolkheti Protected Areas. დასაცავი სახეობები / Species of concern: ვარდისფერი ვარხვი (Pelecanus onocrotalus), ქოჩორა ვარხვი (Pelecanus crispus), წყალმცურავი და ზღვის ფრინველები. ამ ტერიტორიაზე 100000-ზე მეტი წყალმცურავი და 100000-ზე მეტი ზღვის ფრინველი იზამთრებს. აღნიშნულ ტერიტორიაზე 50-100 ქოჩორა და ვარდისფერი ვარხვი იზამთრებს. (Javakhishvili et al. 2014). ორივე სახეობა საქართველოს წითელ ნუსხაშია შეტანილი – ვარდისფერი ვარხვი როგორც მოწყვლადი (VU), ხოლო ქოჩორა ვარხვი, როგორც საფრთხეში მყოფი (EN). ეს უკანასკნელი IUCN-ის საერთაშორისო წითელ ნუსხაში შეტანილია, როგორც მოწყვლადი (VU) სახეობა. / White Pelican (Pelecanus onocrotalus), Dalmatian Pelican (Pelecanus crispus), Waterfowl, Seabirds. 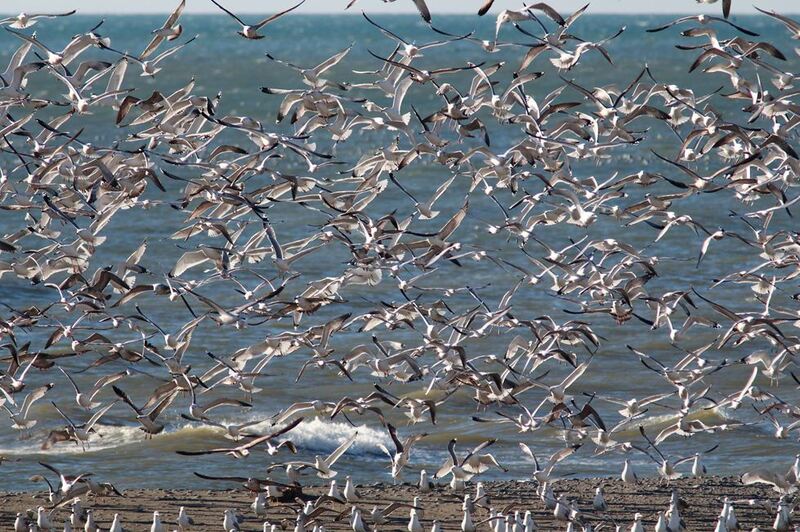 An area is used by over 100000 waterbirds and over 100000 seabirds during their wintering and migration. 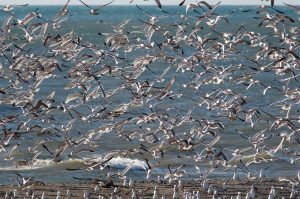 50-100 Dalmatian and White Pelicans are wintering at the SPA (Javakhishvili et al. 2014). Both species are included on the red list of Georgia, Dalmatian Pelican as Endangered (EN), White Pelican – Vulnerable (VU). Dalmatian Pelican is also classified on the IUCN red list as Vulnerable (VU). ტერიტორიის აღწერა / Description of the site: ჭურია საქართველოს დასავლეთ ნაწილში ზღვის დონეზე მდებარეობს. ამ საიტში შედის: მდინარე ჭურიის დელტა, შავი ზღვის ნაწილი, ზღვის სანაპირო, ჭაობები, ტბები და დაჭაობებული ტყეები. მცენარეული საფარის ძირითადი სახეობებია: მურყანი (Alnus barbata), ტირიფი (Salix caprea, Salix alba), კატაბალახა (Clematic vitalba) და ეკალღიჭი (Smilax excels). ჭაობებისა და სანაპიროს მცენარეული საფარის ძირითადი სახეობებია: ისლი (Carex acuta), ლაქაში (Typha latifolia), ლელი (Phragmites australis) და ჭილი (Juncus effuses). ზღვის სანაპიროზე ლურჯეკალა (Eringium maritimum) და ისლი (Carex colchica) გვხვდება. ორნითოფაუნა იხილეთ http://aves.biodiversity-georgia.net / Churia SPA is located in the western part of Georgia on the sea level, at the Black Sea coast. 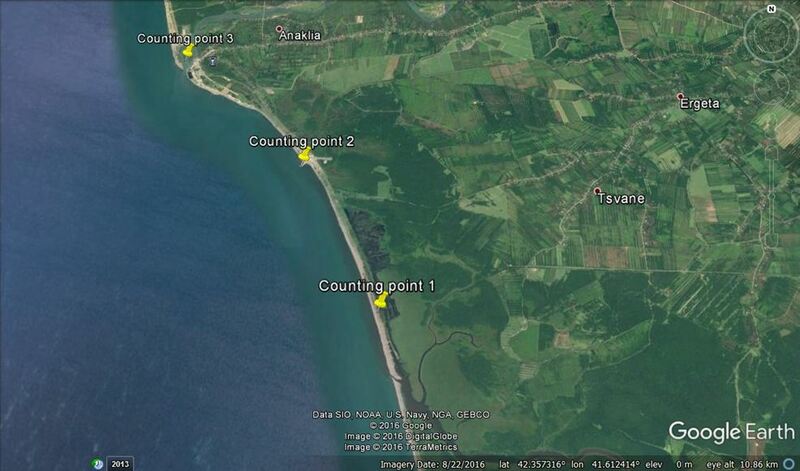 This site includes Churia River Delta, Black sea, sea coastline, wetlands, lakes and damp woodlands. Common Alder (Alnus barbata), Willows (Salix caprea, Salix alba), Traveller’s joy (Clematic vitalba), Greenbriers (Smilax excels), Slender Tufted-sedge (Carex acuta), Bulrush (Typha latifolia), Common Reed (Phragmites australis) Common Rush (Juncus effuses), sea holly (Eringium maritimum), Sand Sedge (Carex colchica) are mains plant species of the SPA (Kvachakidze 2010). See http://aves.biodiversity-georgia.net for Avifauna. აღწერა / Description: წყალმცურავ ფრინველებს ჭურიაში პირდაპირი აღრიცხვის მეთოდით ზამთრის განმავლობაში (დეკემბერი-თებერვალი), 10 დღეში ერთხელ აღრიცხავთ (სათვლელი წერტილისთვის იხილეთ რუკა 1). აღრიცხვის განმავლობაში ზღვის ნაწილთან ერთად მდინარის შესართავს, ყველა ტბორსა და დაჭაობებულ ტერიტორიასაც ითვლით. აღრიცხვების ყოველ ჯერზე, სახეობრივი მრავალფეროვნებისა და მათი რიცხოვნობის მონაცემებთან ერთად კლიმატურ პირობებსაც ინიშნავთ. თვლების შედეგებს მონაცემთა ბაზაში შეიტანთ. აღრიცხვები ჭურიაში რიონის დელტასა და კოლხეთთან კოორდინაციაში ხდება. 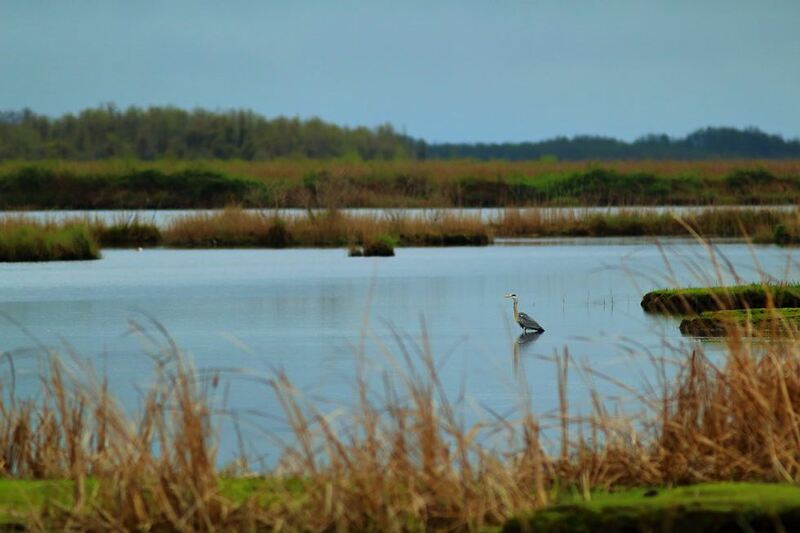 / Water Birds should be directly counted during the winter, with 10 days interval in Churia. 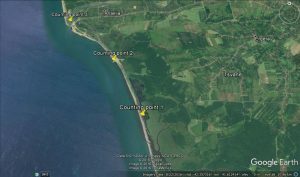 All birds, visible from counting points on the sea surface should be counted. All ponds on the territory should be counted as well. Date, weather conditions and number of birds should be recorded. Count data should be recorded in the database. Counts on Churia SPA should be coordinated with Rioni Delta and Kolkheti SPAs. Counting points see Map 1.